October | 2013 | Can Men Cook? 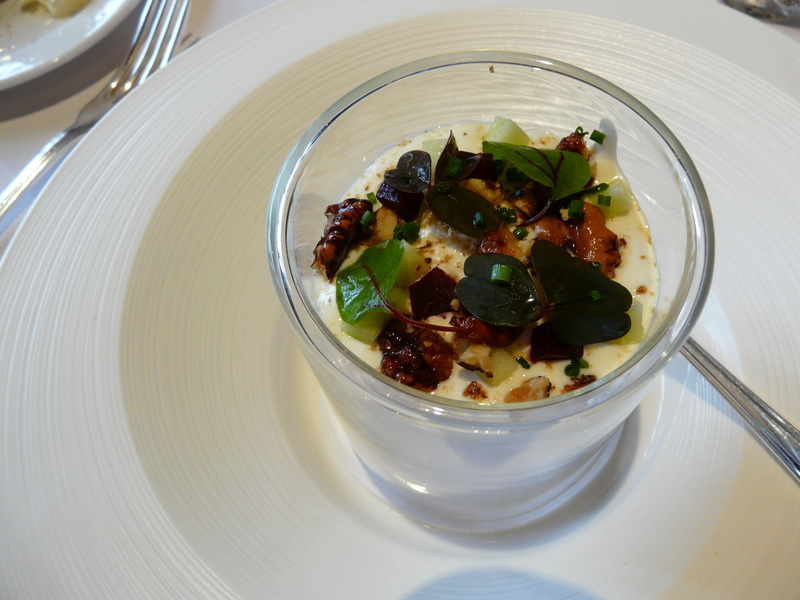 About a year ago, we visited Michael Caines’s 2 Michelin-star restaurant near Chagford on Dartmoor in Devon. It was so good, I decided to take Jane there again for her 2013 birthday. Gidleigh is a magical place – you don’t really need an excuse, just a wallet…but a special occasion fits the ambiance and level of service and luxury rather well. Firstly, if you want to see more go to http://www.gidleigh.com . Welcome back! 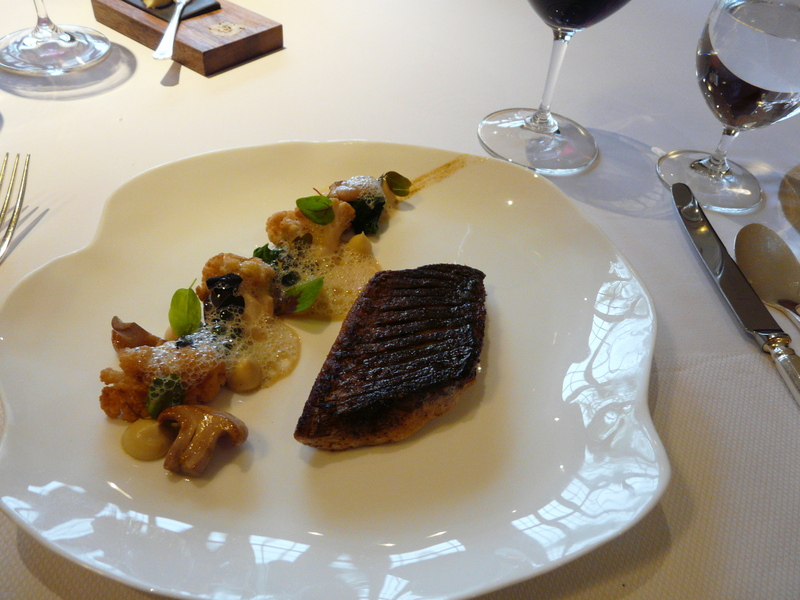 Here’s our lunch: I will describe it in picture order: The top item is just an extra starter from chef – an appetiser. This is a goats cheese mousse with beetroot and candied walnut. After the first spoonful, we both went reverentially quiet. It was, as ever here, exquisitely separate in flavours, but they all live beautifully together. And so it continued. 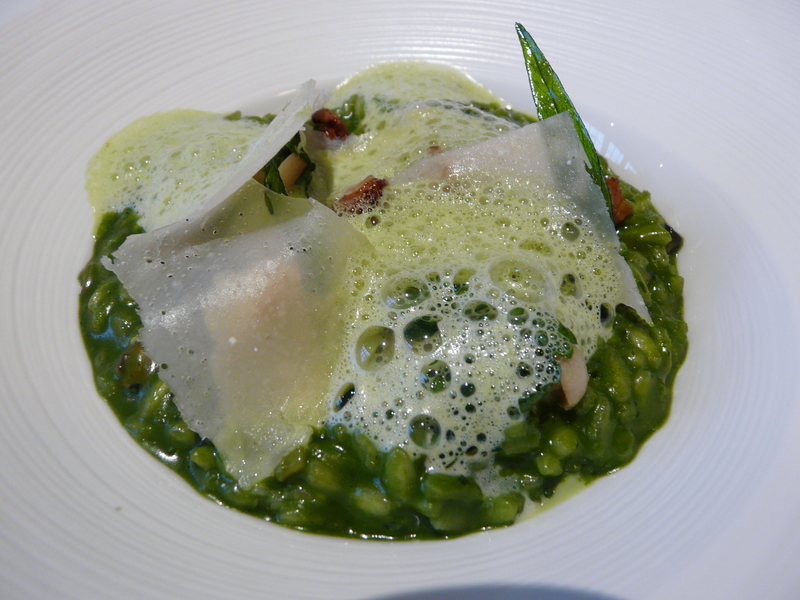 My starter was Nettle Risotto (the bright green photo!) 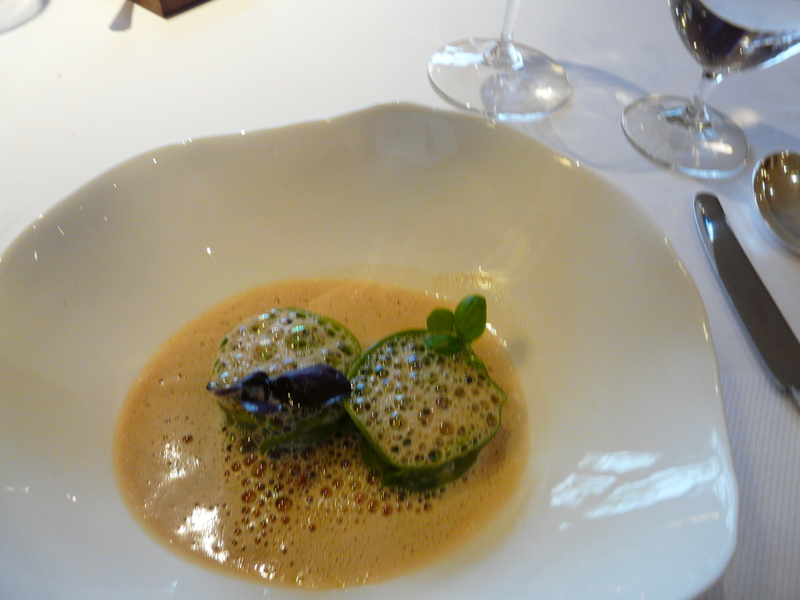 – an amazing conflation of wild mushrooms, watercress (although not too peppery) with a tarragon foam. I just had to have it for the foraged nettles, really. Jane’s is a shellfish bisque – a crab raviolo in basil oil (raviolo is singular – but Jane had plural – two little ones – chef was feeling generous!). The theatre of this is the raviolo arrives in its dish, then the bisque has a separate jug, which is poured over at the table. This means you both get to taste the beautiful bisque through your sense of smell as it is poured. Wonderful. 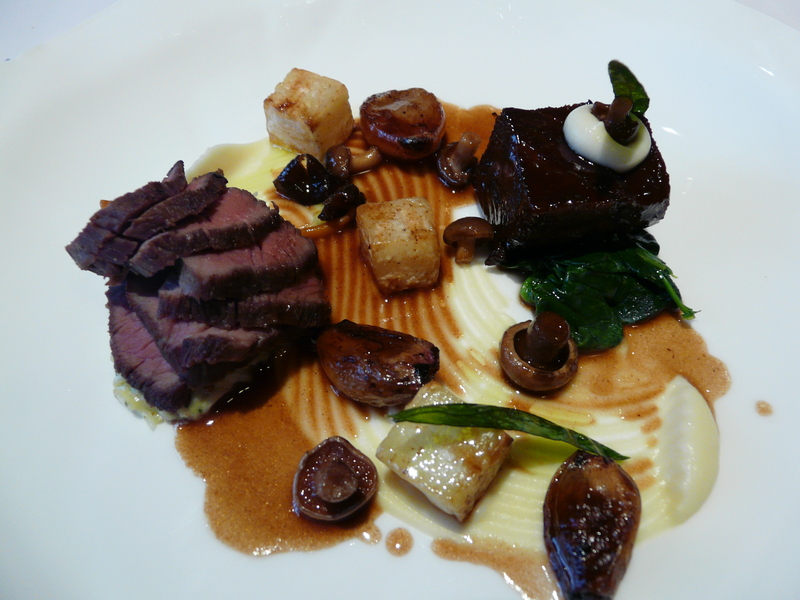 My main is next – Dartmoor lamb. You can see the olive crust, and I bet you can smell the roast garlic (always enhances lamb). The Fondant potato means you do have the perfect way of mopping up the tapenade jus, without resorting to the beautifully flat sauce spoons provided. (I don’t think even I would ask for a slice of bread to mop up, as I would at home!). You can see what you are paying for here. It’s not just the presentation – it’s the fact that there are at least 15 different visible items – and how many ingredients in each? I think Mr Caines only employs people who love food. Janie’s was Grey Mullet – which I note is now often called Silver (sounds less ‘grey’?) Again – 12 different items, including cauliflower (sadly unfashionable now, but presented here in crunchy style with other veg and herbs like lemon thyme, and looking like a vegetable kebab in it’s snakiness on the plate). And a cumin veloute? A very slight indian feel – which I have had with mussels before, and it can take over a bit. But not here. Separate again, and adding to the feel, not overpowering. We both had the Plate of plum – plum tart tatin, vanilla mousse and a greengage sorbet. No photos. We just forgot ourselves and tucked in before I even thought about it! 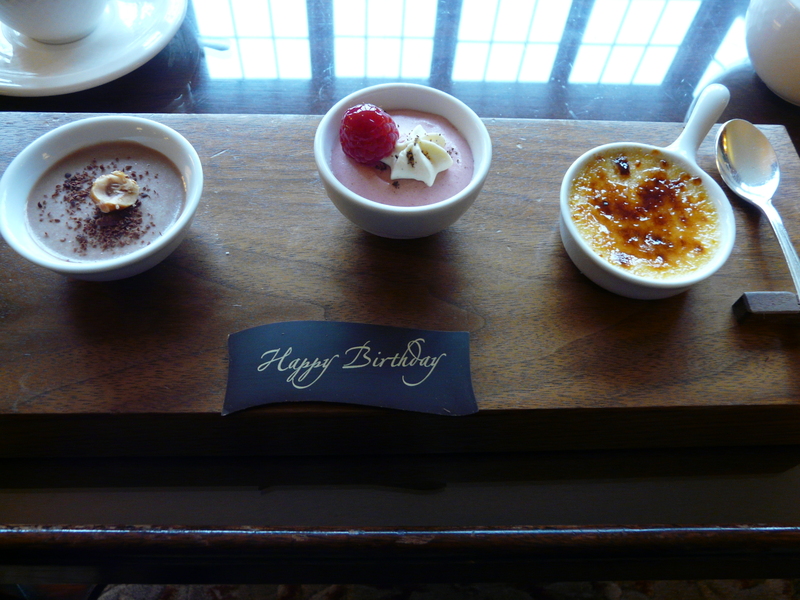 The last photo is a Happy Birthday chocolate with what they describe as petit fours. Look, it is three extra puddings. And you can still manage it. A proper 2 hour lunch. A proper celebration. We loved it.